One ingredient that makes it safe, fun and cuts down on the social risks is to not only be “really good” but to have a really good story. Spreading a story about over the top service or a super unique experience or product is much easier than making a recommendation or referral. It’s still a word of mouth advertisement but without the social risks – it’s just an interesting story that starts a conversation, without anyone’s reputation being put on the line. Another way to cut down on social risks, keep it fun and start conversations is to give people promotion stickers (cool badges) to display. 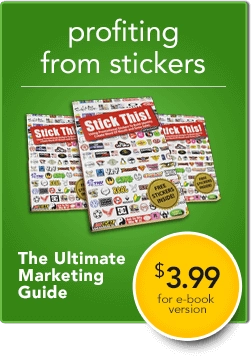 Advertisement stickers are a way to spread stories and stimulate word of mouth, but without the “risk”. Personal “responsibility” for a referral or endorsement is eliminated if someone else is starting the conversation. You aren’t going out on a limb and volunteering information, the other person is taking the initiative (and responsibility) by asking. Perhaps, they don’t even ask but the impression and subtle endorsement has been made. With word of mouth advertisement stickers, there is also no “responsibility” for how the exposure may effect the promoted company. By putting advertisement stickers in your (and other clients) hands, organizations have given everyone the green light to spread the word about their business or product. If the advertisement sticker is subtle and not an obvious paid ad your “reputation” is intact. You are not trying to scream at or strong-arm anyone, you are just a fan that appreciates something and are happy to honestly talk about it with anyone that asks. 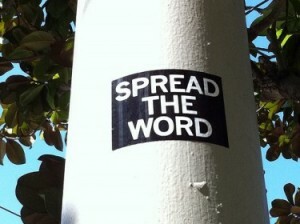 Stickers are of course not the only way to earn word of mouth advertisement or spread stories. What other ways can make giving referrals fun, safe and worthwhile?